with quaint streets and beautiful market gardens, while its impressive ancient city has a stunning entry point through Hadrian’s Arch. Contrasting these two modern destinations is the ancient Crusader stronghold of Kerak. Giant walls adorn the old city and there is so much to see within them – with one of the largest towers found in the whole country. Arrive at Aqaba Airport, where a guide will assist you with a transfer to your hotel. You will then stay overnight at the Raed Hotel. After breakfast, embark on a full day cultural tour starting with Pella, one of the most ancient towns of the world and a favourite of many archaeologists. Pella is exceptionally rich in antiquities, some of which are exceedingly old. Besides the excavated ruins from the Greco-Roman period, Pella offers visitors the opportunity to see the remains of Chalcolithic settlements from the 4th millennium BC, evidence of Bronze and Iron Age walled cities, Byzantine churches, early Islamic residential quarters and a small medieval mosque. Um Qais, your next stop, is one of the most brilliant ancient GrecoRoman cities of the Decapolis. Perched on a splendid hilltop overlooking the Jordan Valley and the Sea of Galilee, Umm Qais boasts impressive ancient remains, such as the stunning black basalt theatre, the basilica and adjacent courtyard strewn with nicely carved black sarcophagi, and an underground mausoleum. After a guided exploration of Um Qais, you will be driven back to your hotel in Amman. Day 2 SUNDAY Aqaba – Amman Enjoy breakfast at the hotel, after which you will have a free morning to explore Aqaba, the ‘Jewel of the Red Sea’. You can visit the beach to really get a taste of the Red Sea Riviera. In the afternoon, you will travel to Amman along Wadi Araba Road, reaching your destination in the evening. Your accommodation in Amman is the Hotel Ibis Amman, where you will stay for the next 3 nights. ADD A PRIVATE BEACH VISIT IN AQABA with transfers, towels, and entrance to beach facilities from $13 per person, payable locally. spectacular natural and spiritual landscapes in the world and the lowest point on Earth. The Jordan Rift Valley is a dramatic, beautiful landscape more than 400m below sea level. Flanked by mountains to the east and the rolling hills of Jerusalem to the west, it has an almost other-worldly beauty – exemplified by the fact that you can float atop the water with complete ease. In the afternoon, you will return to Amman, for your final night in the city. ITINERARY Day 5 WEDNESDAY Amman – Madaba - Mount Nebo – Kerak – Petra After breakfast, drive along the 2000-yearold Kings Highway - the ancient road mentioned in the Bible. Stop at Madaba, the ‘City of Mosaics’, which is found just 30km south of Amman. Visit the town’s main attraction, the Greek Orthodox Church of St. George where the famous 6th-century Byzantine mosaic map of the Holy Land and other biblical sites is found. Proceed onwards to Mt. Nebo, known as the burial place of Moses. The mountain, which rises to 840m, offers a spectacular view of the Holy Land. Continue driving via the Kings Highway to arrive at Kerak, the magnificent Crusader Castle built in the 12th century AD, which is situated on a hilltop about 1,000 metres above sea level and surrounded by a valley on three sides. Kerak has been inhabited since at least the Iron Age, and was an important city for the Moabites. Admire this ancient site, before proceeding to Petra where you will stay for the next two nights at the Oscar Hotel. ITINERARY Day 6 THURSDAY Full day visit of Petra After breakfast at the hotel, you can enjoy a full day visit of the ‘Rose Red City’ of Petra a treasure of the ancient world. One of the Seven Wonders of the World, it is without a doubt Jordan’s greatest tourist attraction. In 1985 Petra was designated a UNESCO World Heritage Site listing. Begin your visit by enjoying a walk or horse ride from Petra’s main entrance to the entrance of the old city through the Siq, which is a 1,210 metre-long canyon. As you reach the end of the Siq, the first and greatest monument of Petra slowly comes into view - the famous Treasury monument, or Al Khazneh. Petra is an extraordinary and unique place, the Nabatean carved their monumental tombs, palaces, temples and treasury from the desert’s natural rose-coloured rocks and sandstones, more than 2,000 years ago. Indulge your camera skills, and allow your professional guide to walk you through the architectural and spiritual wonders of this majestic place. 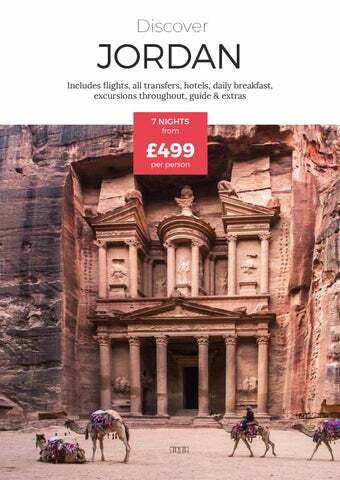 After you’re done exploring, you will be taken to your Petra hotel. ITINERARY Day 7 FRIDAY Petra – Little Petra – Wadi Rum Following breakfast, drive 10 minutes for a visit of Little Petra, an important suburb of the City of Petra. You enter the site through a narrow gorge called Siq al-Barid, or the ‘cold Siq’ – called so because of the high walls that prevent sunlight from entering the canyon. This Siq is 350 metres long with three wider areas inside. It is believed Little Petra was an important suburb of Petra, being the entry and exit point for the trade routes to the north and north-west. Like in Petra, buildings had been carved into the sandstone, used as residences, storages and tombs, with water channels and cisterns. In one of the buildings you can find the remains of painted frescoes with birds, grapes and flowers, dating back to the 1st century AD. Continue to Wadi Rum, Jordan’s vast and echoing desert, for a 4x4 jeep ride. Stunning in its natural beauty, Wadi Rum epitomises the romance of a visit to the desert. With its moonscape of ancient valleys and towering sandstone mountains rising out of the sand, Wadi Rum is also home to several Bedouin tribes who live in scattered camps throughout the area. Wadi Rum is probably best known because of its connection with the enigmatic British officer T.E. Lawrence, who was based here during the Great Arab Revolt of 1917-18. Much of David Lean’s Lawrence of Arabia was filmed in Wadi Rum. You will be treated to an authentic dinner and receive first-hand experience of an overnight stay at a traditional Bedouin camp. ITINERARY Day 8 SATURDAY Wadi Rum - Aqaba Airport After a hearty breakfast provided by your Bedouin hosts, drive to Aqaba for some free time to explore the city or visit the Red Sea coast. In the afternoon, youâ&#x20AC;&#x2122;ll return to Aqaba Airport for your flight home. Found just minutes away from the nearby Al-Ghandour Beach, Raed Hotel is a popular hotel in the Jordanian city of Aqaba. Boasting its own private section of beach property for guests to use, relaxing is easy during a stay here. Many rooms at the hotel feature views of either the Red Sea or the cityscape of Aqaba. Staff are extremely helpful at the hotel and offer a 24-hour reception, while there is also an onsite cash machine. There are numerous activities on offer throughout the hotel with snorkelling, diving, and fishing being popular choices among these. As well as offering an extensive breakfast buffet, the hotel offers a snack bar throughout the day should you get a little peckish between meals. Rooms are comfortable and convenient with modern amenities like free Wi-Fi, flat-screen TVs, and air conditioning in each room. An ideal place to stay in Jordan’s capital city of Amman, the Hotel Ibis Amman is both comfortable and convenient – offering easy access to the airport, city centre, and more. The Amman Mall is found directly opposite the hotel and it’s a popular spot in the city for eating, shopping, and catching up with friends. Those looking to stay a little closer to home for food will find the Oopen Pasta & Grill Restaurant a great place to do so, with numerous international dishes available. Staff at the Hotel Ibis Amman are helpful and can organise several excursions for guests to Amman’s famous attractions – like the historic Roman Amphitheatre. A second restaurant doubles up as a bar throughout the day and offers a hearty buffet breakfast to ensure guests start the day with plenty of energy. Rooms at the Hotel Ibis Amman are modern with amenities like free Wi-Fi, flatscreen TVs, and air conditioning. Accommodation Petra OSCAR HOTEL Found just outside the UNESCO-listed city of Petra in historic Jordan, the Oscar Hotel is a convenient hotel choice for those looking to get out and explore what this majestic city has to offer. Just a kilometre away from the archaeological centre of Petra, the Oscar Hotel is an ideal place to begin and end your days of sightseeing. Offering a wide continental selection for breakfast each day, as well as hot drinks, juices and soft drinks – you’ll be set up well for the day ahead. Rooms at the Oscar Hotel are spacious and modern, giving guests everything they need for when they return in search of a peaceful night. Accommodation Wadi Rum WADI RUM BEDOUIN CAMP Today the local Zelabieh tribe are the custodians of the Wadi Rum protected reserve, many making a living as guides and drivers. Although you could, if pressed for time, see a selection of the main sights in the reserve on an afternoon four-wheel drive excursion, this is a landscape that is worth savouring. To really appreciate Wadi Rum, a night in the desert is recommended. Sleep outside in the desert sands at a Bedouin camp, under a blanket sky strewn with stars and wake up to the fantastic spectacle of sunrise. While staying at the camp, you will be provided with a traditional dinner as well as breakfast the following day. Spend the night listening to traditional storytellers, and savour the magic of the desert. Fleetway is a well-established company which has been successfully in business for over 45 years. Our aim is to supply bespoke luxury holidays at market leading prices. Our dedication to quality and customer service, we believe, is unparalleled and all travel services sold to our customers are fully protected, financially and otherwise, under our ATOL and ABTA licences, furthermore for additional protection we issue ATOL certificates with every holiday booked with us. All Inclusive Forget cooking, these all-inclusive breaks have got you covered. 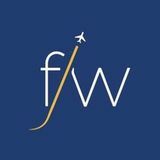 These Fleetway allinclusive deals are here to make your holiday as relaxed as possible. With food, drink and so much more taken care of, you’ve got time to focus purely on you.